Over the last years I have flitted between GPS watches. In the early days a Garmin forerunner 910 XT was always my best friend but then others tempted my fancy. I won a Sunnto ambit 3 in a race and bought a Polar V800. So now I had a choice between three but was never entirely happy with any of them. I was sure each had its specialties but there was no watch that I considered to do everything and definitely not one that did everything exceptionally. On hearing about the apple watch I was momentarily excited. Apple changed the phone game when they launched the IPhone. Features that other companies had been trickling out over years were suddenly all available on one device. Could a similar thing happen to watches? A device that can have maps, track your activities, even act as an emergency beacon if things went bad? No, the apple watch wasn’t going to have its own GPS, so in order for it to function properly it would have to be tethered to your phone…stupid. The safest thing to do when running, in the mountains at least, is to have your phone off and tucked away in a sealed bag, ready and full of battery to be used in an emergency. So if I was still unenthused about which watch was best, why am I bothering to write this? Because things changed a little while ago when I got a Garmin Fenix 3. I’m not going to write a full blown review of it but thought I would at least write what functions I like and what I think the Fenix 3 does better than its main rivals. First I guess will be how the watch looks/feels. The three things I like most about the Fenix 3 is firstly the buttons are really responsive. When doing intervals, its nice that when you press the lap button you feel it registers properly and promptly, unlike the Sunnto’s buttons, which seem to stick a bit, sometimes failing to register at all or with a delay. Secondly how the watch and more importantly the screen looks. 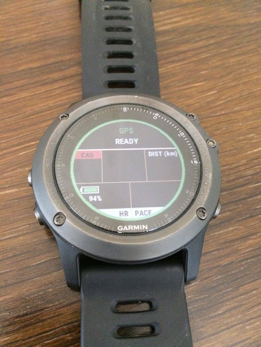 The Fenix 3 has a colour screen and is far clearer than the Sunnto and the Polar. 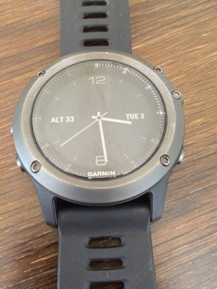 The Fenix 3 is slightly larger than the Polar but about the same size as the Sunnto. It seems more smooth though and therefore catches when you are putting a jacket on far less. It may surprise people that although tracking workouts to give you real time data and a chance to analyse this data afterwards is the main purpose of a GPS watch (either that, or so you have something to upload to Strava) but for me the most useful thing about it is the navigation function. The Polar V800 doesn’t do navigation so I won’t be mentioning that but both the Sunnto and Garmin do. For those that are not sure what I am on about the principle is you can upload GPX file into the watch. When activated you will see a line of where you have planned to run and an arrow representing you and the direction you are facing. I use Strava route planning to help plan the run so I can use the heatmap data to see where most people go. Planning a route in this way is invaluable for when traveling to a new place so you can do a better run than ‘round the block from the hotel’ and for in the mountains, especially if the visibility gets low. Yes, you don’t see a full blown map with any detail but it’s surprisingly easy to match paths and turns on the watch to what you are seeing on the trails. So the Sunnto does this too and does it really well. 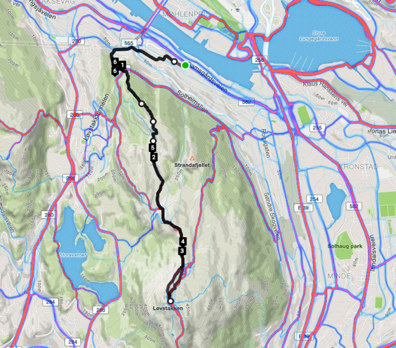 In fact, the fact the Sunnto automatically scales the map the closer and further you are from the route and has a much easier way of uploading GPX files almost makes it better. 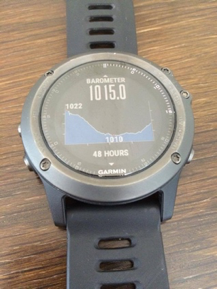 The Garmin allows you to manually scale and look around the route. 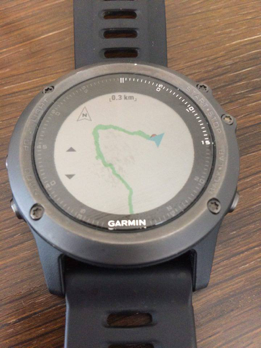 The Garmin has a colour screen making the map clearer. The Garmin will plot where you have run (black line) so you can can see how it is comparing to the planned route (green line). 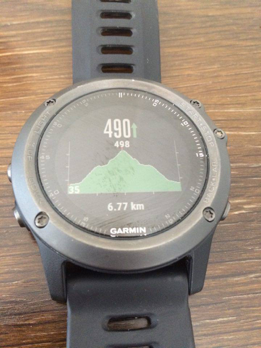 If you scroll down a data screen the watch will show an elevation profile of the route with where abouts you currently are. So you don’t have to wonder how far up a big climb is left. The only thing I am not so happy with is the fact the map is scaled smaller than the Sunnto, so its less easy to see the detail of the route and exact locations of turns etc. Maybe you can reset this scale and I just haven’t figured out how. Now for how the watch functions when you are using it to give you real time data. I think this is where the clarity of the screen really helps, in fact the screen is so clear and you can see the numbers in so much detail that you can clutter the screen with more than 4 data fields and still see everything clearly at a glance. I downloaded a running data screen which shows everything you could possibly need on one watch face. This means no more endless scrolling through different screens to see the stats you want. Its all on one. Now this is great for flat or road running but it doesn’t give you much data for in the mountains. Things like how fast you are climbing, the grade of the slope or your current elevation can be really useful. The Fenix makes it really easy to see this data too, in fact it does it itself. If you activate ‘auto climb’, when you start going uphill the watch face will automatically change and shows you climbing stats (which you can customise). Once you hit the flat again it will switch back to the original data screen, pretty nifty. Something that is really key to how happy I am with a watch is whether it functions well or not. By this I mean how quickly it finds satellites, how easy it is to use and whether it uploads well or not. Compared to the Sunnto and the Polar I have had no issues with any of these. 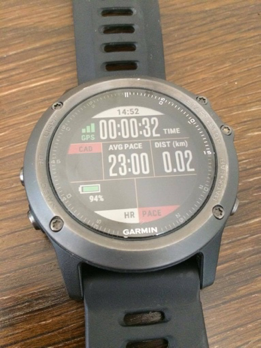 It usually picks up satellites within seconds, the usability was second nature to learn and with both Bluetooth and Wi-Fi the watch transfers data to Garmin Connect and Strava before I have even taken my trainers of. It is also worth noting that since getting the watch I haven’t had to un-pair and re-pair it with my phone once, unlike the other two where this was a daily occurrence. I have noticed that GPS accuracy is slightly less than the other too but then I rarely run in built up areas and therefore don’t have too much of a problem. Like I said, this wasn’t a full out review but shows what I like about the Fenix 3 and why I’ll be using it for the foreseeable future.